A selection of gift wrapping ideas, inspiration and products, as discovered on Pinterest. 1. Blue Stanton Gift Wrapping Cart. From The Home Depot. If you’re serious about gift wrapping, You have to have a wrapping station. This cart has a spot for everything and would look very nice in the corner of a craft room. 2. Yarn and stars gift wrapping. By Manuela on Pink Frilly Handmade. I’ve always loved yarn as a substitute for ribbon. Paired with polka dots and stars as it is here gives it even more homespun charm. 3. Drawstring bags. From Between the Lines. While these particular bags are no longer available on the Between the Lines Etsy Shop, if you like to sew, you could easily whip up your own version. I just love the black and white pattern combo. 5. Patterned paper bags. From Petra Boase at Not on the High Street. Love the mix of bag and washi tape patterns and colours. 6. DIY paper snowflake gift toppers. By Silvia on Giochi di Carta. Add some three-dimensionality to paper snowflakes by doing an accordion fold and all of a sudden they’re not your kid’s craft project anymore. 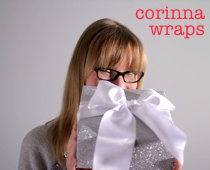 Visit my Gift Wrap and Packaging Pinterest board for more ideas.